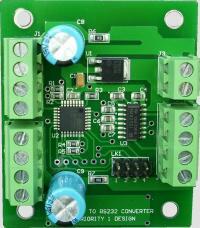 Dual wiegand to RS232 converter. Input connectors for 2 separate wiegand streams. 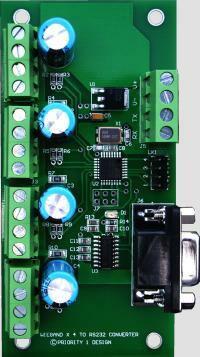 DC operation from 6.0V - 24.0V dc. Generic Wiegand detection up to 48 bits. Outputs 6 hexadecimal ascii characters at 9600 Baud. (*1) Other formats available on request. and converting it to a RS232 data stream at 9600 Baud. Input connectors for 4 separate wiegand streams. One RS232 output port on a DB9 connector. Generic Wiegand detection up to 56 bits. Outputs hexadecimal ASCII characters at 9600 Baud. 2ms where both lines are held high. In this fashion each bit is transmitted in sequence until all bits are sent. 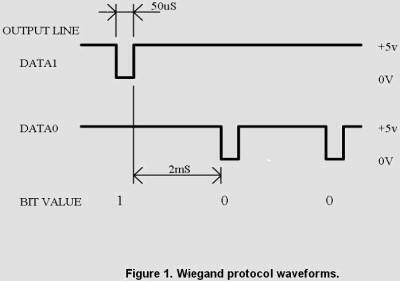 shows an example of the timing sequence for Wiegand protocol. Wiegand 26 protocol is defined as a stream of 26 bits, consisting of 1 Even parity bit, 24 data bits, and 1 Odd parity bit. Wiegand 37 protocol is defined as a stream of 37 bits, consisting of 1 Even parity bit, 35 data bits, and 1 Odd parity bit. The WIE232-A and WIEG4PRT-A will read signals presented in Wiegand 26 or Wiegand 37 format and after checking for parity and bit length will convert the data stream to a serial RS232 output on the corresponding output connector. SSnnnnnn<crn> where SS is the hexadecimal value representing the number of bits received. nnnnnn are the hexadecimal data output and will vary in size depending on the number of bits detected. 2 characters are needed to represent 8 binary bits. PA:XXYYZZ<crn> where P is the ascii start character for all data output strings. PA:MKKXXYYZZ<crn> where P is the ascii start character for all data output strings. PA:SSnnnnnn<crn> where P is the ascii start character for all data output strings. SS is the hexadecimal value representing the number of bits received. The serial output stream is sent at 9600 Baud, 8 data bits, no parity, 1 stop bit. This site and all images and content within are Copyright © 2007 Priority 1 Design. All rights reserved. This page is best viewed at 800x600 pixel resolution.